This Week’s Picture of the week is “Gerard Andrew and Jane Simmons Bolick Family Bible Records”. The above image is one of several photgraphs taken of Gerard Andrew and Jane Simmons Bolick’s Family Bible. There are several historic family bibles that have been digitized. The Government & Heritage Library at the State Library of North Carolina has an extensive Genealogy Collection located on the West Mezzanine of the Archives & History/State Library building. 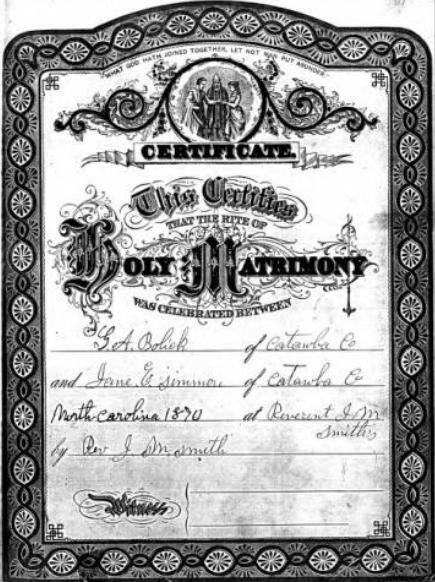 Beginning and seasoned researchers utilize these resources to trace families in North Carolina as well as the states from which many migrated. The collection contains family histories, published abstracts, periodicals, county histories, and reference materials. It also contains published materials for areas from which many North Carolinians came, and states to which many North Carolinians migrated. There is a large collection of census records, an assortment of electronic databases, and vast microfilm collections. « February is Black History Month! !